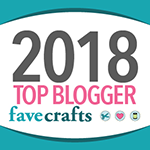 In just a couple of weeks, I’ll be at the Knit and Crochet Show in Manchester, New Hampshire – helping to celebrate the Crochet Guild of America’s 20th Anniversary. 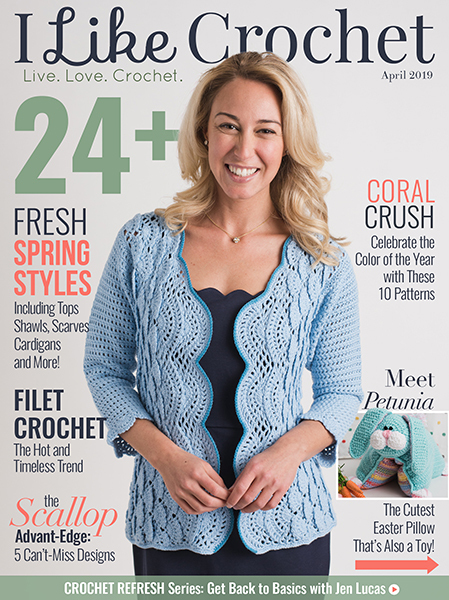 I’m super excited to go, and all that excitement has inspired two new crochet patterns! And since I missed last week due to flooding, I thought I’d best share both this week… Introducing the Manchester Handbag and Sunglasses Case! 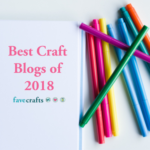 This post has the pattern for the handbag – click HERE to go to the pattern for the Sunglasses Case! They make a great set – but of course they are super fun on their own as well! Finished size: 11″ wide and 7″ tall underneath the handles. 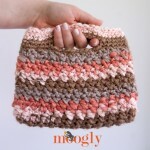 NOTE: You can carry the yarn along the inside of the bag rather than cutting it after each row, if desired. And that’s it for the bag! 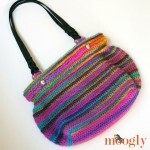 The post stitches plus color changes create a great pattern and texture to this simple bag. I hope you enjoy making it. 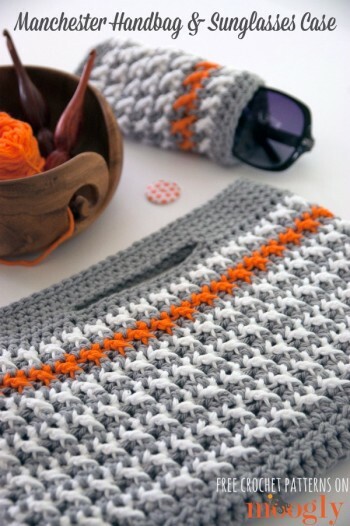 And be sure to CLICK HERE to get the pattern for the matching Sunglasses Case! thanks very much for the lovely patterns. they are not only free but u are gracious enough to let others sell what they make out of these patterns. 😀 I’m glad you like them Shakila! This is so pretty! I love all of your patterns. I’ll be making this one for sure. I’m just finishing up my 6th and still trying to decide the pattern for the remaining two. I absolutely love the look of this stitch on the body of the bag and think it would be perfect. Any chance you could tell me how to obtain this stitch pattern in rows? Sorry for the very wordy post. Thank you for the response. I’m starting one now. So with color A I’ve chained 43 (I’m using chunky yarn and an 8mm hook). I’m working HDC across for 42 stitches. So this first row will be wrong side. Do I switch to color B for row 2 and then alternate each row? I’m not sure if it’s because I’m using the chunky yarn, but I just can’t seem to get this right… I can’t tell from your photo or the instructions but when a FPDC row is complete, will every post from previous row be worked, or will it be every other post? Hi Carolee! Out of every two sts, one will have an hdc in it, and the other will have a fpdc worked around it. Does that help? So cute! Could you please share your guage and the dimensions of your finished projects for these? Beautiful pattern. And I love the furls hooks and that stunning yarn bowl! Oh my gosh, this is ADORABLE!!! 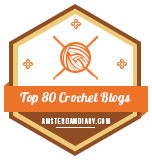 I love crocheting in cotton – and I love this stitch. 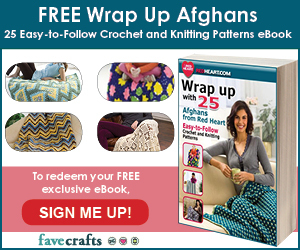 You are so talented – thank you for being so gracious with your patterns and help. ps, where did you get the Stormy Skies Bernat Cotton? so cute!! I can’t wait to make one!!! I am about half way done with my “at the beach” bag, I ended up using navy and white just like yours!! Its such a nice big size! I love it!! Thanks for another new bag pattern, they are my fav to make!!!! Hey, i loved dis 1 alot!!! To make a courier bag you would simply need to not make the CH spaces in the sc. That means that in round 21, you would sc around (just like you did in round 20). Now you don’t have to hole for the handles. After you did that work the rest of the pattern as written. 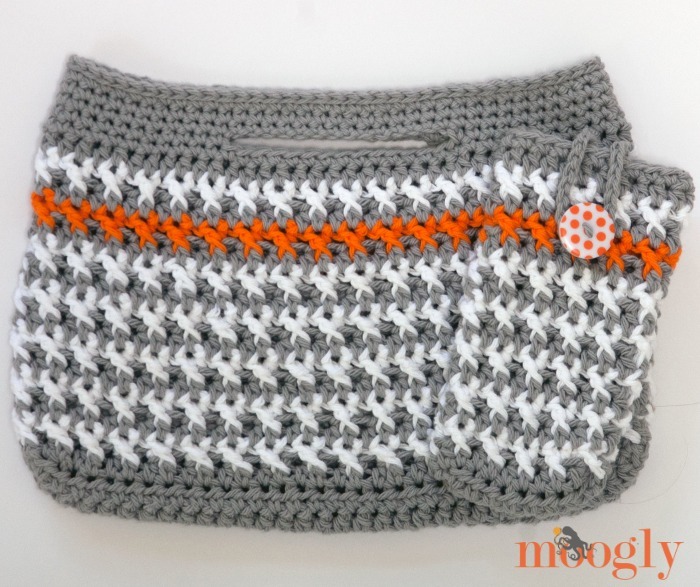 After that you would crochet a strap and sew it on. For the strap I would ch 5+3 (5 being the number of sts across, 3 the ch three at the end of the row. 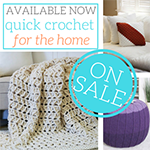 Only if you are using double crochet though. If you want to make a sc strap I would do 5+1.). That is just preferencehowever, you can make it as skinny or thick as you want. I love this little bag. Thank you for the pattern. I’m thinking of making this as a crossbody bag…what do you think? 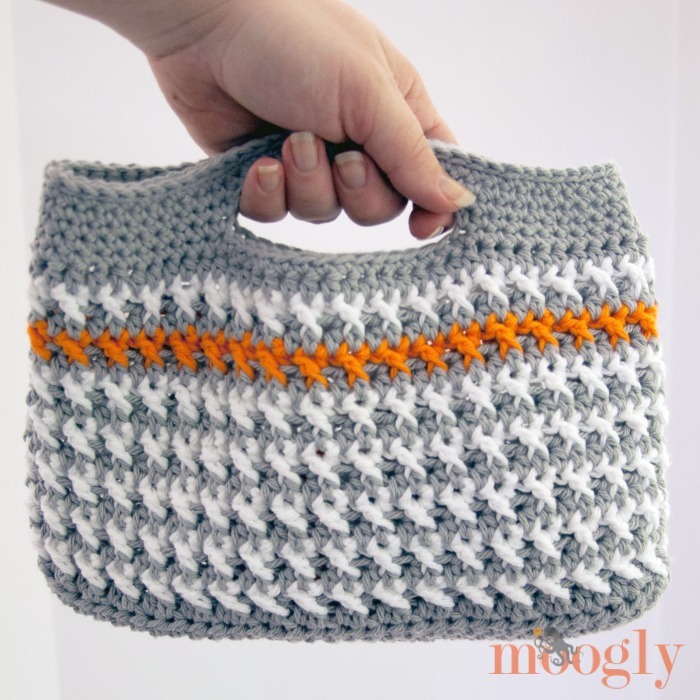 I love the colors and the stitch pattern but I use a walker so can’t carry handbags. 😀 Thank you Cari! Those colors sound fab! Tamara, Thank you SOOOOOOOOOOO much for sharing your wonderful talent. I did my first one and loved it! So did my friends. I’m on to my 5th one now, everyone’s chosen different colours, but they all look wonderful. 😀 That’s fantastic! Thank you so much Colleen! i love the handbag and sunglasses case! I’m having trouble with the fpdc row. I end up having 44 stitches, because how I am understanding the pattern is this; ch 1, hdc, go back and fpdc around the ch, go back to the u worked stitch before the first hdc and stitch an hdc, then go to the first hdc and fpdc around it, and continue on around. Please, help! I really want to make these!! The video will help for sure. I can’t wait to make one for myself and a few for gifts! I’m having trouble with the stitches when you complete a row. They don’t connect as they should…what am I doing wrong? Thanks in advance…I’ve made three ofnthese, and always have the same problem. Any help you can give, is much appreciated. Hi Jo! I’m afraid it’s impossible to say without a photo or more info. How do you mean they don’t “connect”? Finally got it. When ending a round, It would not in a place where a fp or hdc was in the right place..
I’m glad you were able to get it Jo! 🙂 Thank yoU! Hi Helen! I’m afraid I have to say no. I have my own youtube channel I do tutorials on. 🙂 Thank you for asking though!